By Cal Speed of Bakersfield Dyno 580 H.P. Car has been setting for 2 years and is fully ready for the dunes. Gr8 car handles very nicely. BFD Revo. Purchased as rolling chassis from BFD then powertrain added. 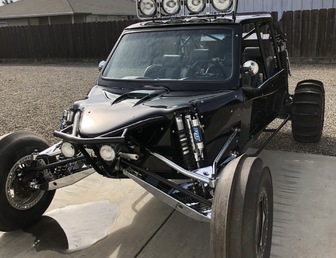 2007 Desert Dynamics Dual Sport SAND RAIL Custom CAR Mint was $130+K new. Optional 4 HID Driving Lights 4"
Less than 100 hours on car, one owner, never wrecked, raced or abused. Just serviced, new alternator, new batteries & ready to hit the sand! 2005 SCU Long Travel Sand Car. 2005 SCU, Sand Cars Unlimited. *4 Seater Chassis, 2" Hollow Spindles, 2.5" Howe Pwr. Steering. *Full Body, with windshield, Heated Seats, MoMo steering wheel, Radio PTT on the wheel. *Mendeola S4 Sequential Transmission (just serviced 4 trips ago, 2 last year, 2 this year, Have receipts). * Full Bypass, 2.0 Fox Fronts, 2.5" Fox Rears. * New DWT Wheels ( 0.250"), with OMF reinforcement rings. *10.75" STU Razor Blaster front tires. * Baja Designs XLR-80 Pro front headlights, Average LED bar. *Lowrance Baja HDs-7 Touchscreen GPS. *PCI Intercom and Race Radio set up. *New Seatbelts, Front and Rear. *New Fuel System, filter, pre and post, quick disconnects and isolation valves. *New Battery, with disconnect switch. This is just a great handling, super reliable car, I'm not convinced that I want her gone, but it may just be time to start a Jeep project. Let me know if you have any questions, You can test drive here at the shop, or I can meet any serious buyer in Glamis for a test drive. $50K. 2016' Carson 26' Enclosed trailer W/ V nose (30' interior length) also available, Lots of options, Electric tongue jack, 4" side doors, both sides, LED lights, panels, vents, tow hooks everywhere, cable spreaders, etc. $10K once the car is sold. Car can have doors added by SCU and can be sold less motor too. As it is this car is super easy to get in & out of & you feel 100% safe while in the car. Lots of thought went into the design to ensure it’s as safe as any car Don builds. Lorance GPS system, clear title, low miles, super clean. 2014 Aluma trailer is custom built for the sandcar. Dual Axle, all aluminum, the deck is 102" width. Removeable fenders, aluminum mag wheels. In good condition, runs good. Desert Dynamics Sand Car will trade for 2 seater! WILLING TO TRADE FOR A 2 SEAT SAND CAR. NO 2D transaxle please! All maintenance and work done to the car has been professionally done by Kevin McMullen Racing in Peoria Arizona. Car is very clean and has a lot of new parts on it to make sure the car is reliable and also to have spare parts as well. I also had the suspension and skid plate re powdered coated and had the paint redone as well, must see the paint in person to see the full details, I had my painter paint it hot rod theme with a little bit of low rider style mixed in with the graphics. I have all of the spare heims which are still in good shape and didn’t need to be replace, (4) spare 934 CVs, and a spare starter as well. The transaxle was gone through completely in December 2018 by Kevin Mcmullen Racing. I have all the receipts to prove that the work has been done. -Dual Sport with Pre-Runner boxed A-arms and trailing arms. Full body car with new windshield with custom paint job, this car is a must see in person. I would trust to drive this car anywhere. I have more parts that aren’t listed so if you are interested please call or text to get more information. Expedition chassis built as a special construction, Long travel conversion done by Carlin fabrication. Fox shocks, suspension tuned by Tyler Scott. 33 15 sand blasters 880 triple razor steers. Limit straps on all four corners,Power steering, Prp seats bench in rear, black and green PRP tool bag, fire extinguisher, flash light,Console with Gauges,race radio, car to car 4 head sets. 5 small hid lights on roof, 2 large hid on A pillar, multi color dome light, courtesy lights bellow A pillar, two wips, 12v power plug. One piece rhino lined floor. Quick release steering wheel, 12v H/D kill/disable switch with removable key. 3.5L "short star" 2into1 jet coated exhaust. Quiet at idle but sounds pissed off when reved. 091 with good internals maybe 7 short trips on it, 930 cv's with grease zert spacers. Brand new micro stub axle/break kit from Jamar(X-series) new powder on rear trailing arms, CV's just inspected and serviced Two piece skid plate one under trans, one under motor, Car is all paint, does have some minor wear spots. Box of spare parts, as well as a spare set of paddles. I dune with a wicked, SU, and a few other cars. Does just fine and uses less fuel then them. Good hassle free family car, just looking for something different. -originally built as a sand car, later upgraded with sandlimo heavy duty desert arms front and rear and then all suspension pickup points upgraded by jerry at penhall fabrication.